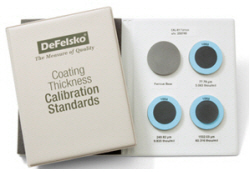 Used to verify the accuracy and operation of coating thickness gages and are an important component in fulfilling both ISO/QS-9000 and in-house quality control requirements. Contracts often specify that coating thickness measurements be taken by gages whose measurement accuracy is traceable to a National Metrology Institute such as NIST or PTB. To learn more, visit Certified Thickness Standards.